To those who have heard of beauty expo but have not attended before would usually ask what to expect from this huge beauty convention aside from just hair & make up show, beauty panels and sales? This Expo's core intention is to actually build bridges for international beauty brands to expand their products to Malaysian shores. It's actually more targeted for people who are working in this industry than normal public goers, don't get me wrong it's opened to all to enjoy just that Beauty expo is actually more of a trade exhibition above anything else lol. For public: please register on-site (as trade visitor) to get your tags before entering the halls. Crowded halls (1-5) so make sure to take care of your belongings, zip your bags ladies! For the public eye, it's a good place to grab good deals on hair, skincare and cosmetic products and even try out new brands that isn't in Malaysian market yet! Portable compact hair straighteners should be made as an ESSENTIAL because that's how we can have saloon styled hair throughout the whole day and imagine what a lifesaver it would be for frequent travelers! Don't freak out if you see people poking needles into customer's face k? Quite a common sight for Aesthetics booths, i honestly don't think it's that hygienic to do such treatment for public events since it's exposed and all lol. 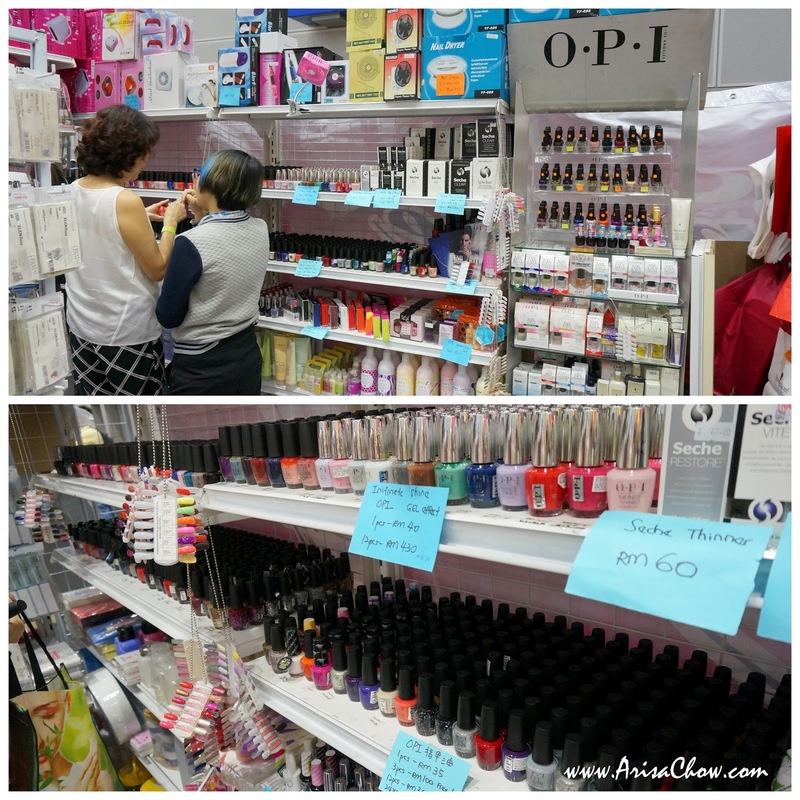 What can you find in Beauty Expo? Anyway the person in charge themselves are usually at the booths, they are more than ready to answer any of your inquries or even clear your doubts! Sadly she no longer brings in this awesome masks (really top notch quality) from Taiwan as costs are rising and it wasn't worth to bring in anymore especially since our economy (ringgit value) is heading towards a downfall. Going at cheap prices, if you are a mask junkie confirm every few steps you will see a booth offering facial masks lol. For cosmetic/ skincare going on sale always inquire for the MFG date or expiry date! That's my advice for first time beauty expo shoppers, as there are many other offering the same equipment for all you know at a better pricing than the one you saw. Take your time to survey the tools, prices and make sure to remember where the booth is (better take a name card)! Most are China manufactured tools so it's not something branded but still works like how it's supposed to la. Lol. Price wise you may find some suited for your budget easily as it ranges from RM40- 150 for basic hair styling tools like hair dryers, curling thongs, straightener in all sizes and even that heated comb that straightens hair upon combing that went viral on facebook about 2 weeks ago! You might be super excited over your bargain hauls, but always test your electronic purchases* at least 5-7 minutes to see whether there is any defects as there are usually no exchanges once the expo is over. * I personally experienced this that's why i purposely came all the way back to the expo on sunday (yesterday) to exchange for a new straightener as the one i bought short circuited in my hand as i was using it earlier. Don't just test ON/OFF only, keep it running for 5 minutes+ for better observation, even better test using it on your hair immediately. Weight loss supplements, slimming services anything to do with weight management you can find it here lol. But please do be selective, do research and consult with the distributor before blindly purchasing and consuming. As far as i know consumable products, not everyone is suited for due to it's ingredients. Aroma therapy brands like these for example are from Taiwan looking for local distributors to carry their brand. These kind of stuff usually used in massaged parlors. Prices all seen in beauty expo are normally wholesale price or distributor price which is usually 50% lesser than retailed prices, so those who plan on starting a beauty business and is in need of stock replenishing should drop by beauty expo! Mother of all hairsprays for cosplayers, scent might be strong for this guy (purple tin) but this brand is commonly used among hair dressing students and cosplayers as its holding power is decent and plus its super cheap. Outside this is usually sold for RM15-20 (In beauty expo- RM8.50) and for coloured hairsprays it could easily cost RM25-35 (in beauty expo- RM10) a tin when it is not in season. So cosplayers, don't say i didn't share ya! Most cosmetic booths usually have clearance & sale so keep a lookout for them, heck you might even find some nice cosmetic brushes for lesser than RM20! Just don't expect to see brands like MAC, Bobbi brown in beauty expo la XD But more to China, Taiwan, Korea and Malaysia brands and so far the only Japanese brand I've saw was Canmake and they are having bundle deals which i personally think is a great steal! Make up bags and casing of all sizes selling as low as RM60 and on top of those they have deals like purchase 3 and get 70% off each casing. Material is bad, sturdy and not so flimsy, those who have been dying to own a make up case better get it in beauty expo, because from my experience purchasing outside and online the same item you see in this picture the price are jacked up to RM200-300 for a medium size casing and larger ones RM400-500. I find those pricing ridiculous! Plus over here you can at least check the product thoroughly before paying. This is like every beauty junkie's dream wei...it is sure to fit all our cosmetics and heck it has wheels! This guys were selling from RM300+ onwards, considered 'decently' priced la for something like this because outside these bags could have easily cost RM699-799. Someone please let me know if it's going for any lesser on the last day! Selling at RM250 which was pricey for the normal cosmetic box as the plain black & silver ones are only priced RM90-120 for the same size (has 4 tier compartments in side). From the top left: Assorted Hair brushes selling dirt cheap (2 for RM11) at Yokoso booth (hall 5), Portable hair iron from Teeni Enterprise (distributor for canmake cosmetics as well), Canmake stuff of course lol and some hairsprays for my wigs. Like i said, you can find ANYTHING beauty related in this expo. Want make up table with lights? Sure! Want to own your very own home hair steamer? Yep! Large travelling cosmetic bag with a trolley? Definitely, have your pick! It has everything you need to even open your own beauty parlor/saloon lol. 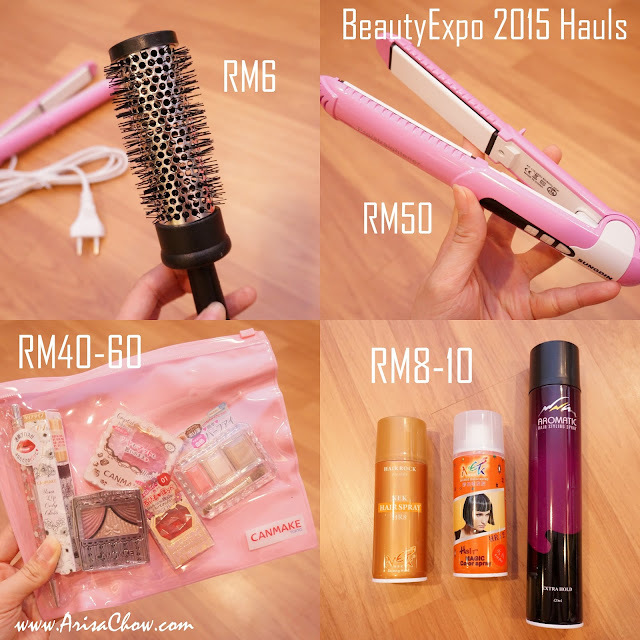 So I do hope this long crappy blogpost may give you a glimpse on what to find or expect for Beauty expo, i also apologize for so many pictures as it may take some time to load lol. alooo!!!! I miss this...i would love to visit too. good haul dear! KENAPA I tak tahu ada beauty expo ni... sedehnya the beauty box nampak awesome sangat !! Too bad I missed out this expo, my younger bro jio me but because I got some events going on weekend, yahhh T__________T Hope can catch up next beauty expo! I miss it ... Last year I grab a lot of beauty products. this Year like budgeting. Although I am a lazy lady. But it's worth to visit beauty expo. Hope to join next year. wow didn't know they are so many beauty stuff for sale. Should go next year!! I was just reading about this expo for next year. It's a trade expo and is only for those in the industry. Not sure about general public. I miss out the event. So many beauty products on promotions and so cheap. I was there too on saturday for Canmake and I bought some hairstyling products which is really at a good bargain. nowadays there's an expo for anything and everything. This is a good thing too, with the rising cost of living, anywhere which gives a lower than usual pricing is a good place. oh wow so this is what the beauty expo is about, that's so much fun there, not just shopping but can try out the services too huh. Oh no! I missed this expo!